An interesting post from Chris Walden in today’s Shadow Digest touched on the creation of alternative universes. Without that we are presenters of puzzles, or displayers of skill. Nothing wrong with that; but it’s not magic. Perhaps that is what attracts some of us to bizarre magic, in which the story — the temporary creation of an alternative reality — is central. If the focus of our performance is to fool our audience I believe there is something missing. Indeed, many spectators may feel a little aggrieved. It’s “fun to be fooled”? Not always. As magicians we may enjoy that; some equate it with being made to feel foolish. Or being challenged to seek a solution. The magic isn’t in the puzzle, it begins in the narrative — the story — which surrounds and supports the trick. Only then can the magic happen where it’s supposed to happen… in the minds and hearts of our audiences. To put it another way, aren’t our tricks the illustrations to our stories? And doesn’t our craft lie in the way we bring them together to truly tickle our spectators’ ‘wonder muscles’? Tell me what you think. I’d like to know. I have to agree with the sentiments of the post. Magic should be a means to illustrate a story or emotion and not just a puzzle. My feeling is that to many magicians perform magic as a way of gaining power over a group of people. “Look how clever I am” “look how cool I am”. And a lot of them do this at the expense of their audience. We should take our audience on a journey with us and show them something that breaks the rules of reality in a fun and engaging way. Not ridicule them and get a cheap laugh because they have not taken the invisible cards out of the invisible box before shuffling them! Better stop before I loose any more friends or this turns into a real rant. 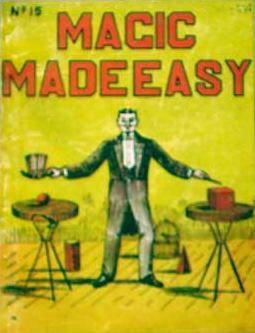 But on the flip side… I don’t want rubbish magicians trying to do bizarre and story based magic as they wont understand that the story and emotion come first and the method second and that above all, the Magician comes second to the story. But Andy,I enjoy a laugh,cheap or otherwise!! A laugh is a laugh. “Couch”? You don’t mean “shelve”? Yes, there’s many a trick that has me in tears. Andy Russ i agree with you both, i hope that’s where my last show was at well the twins bit at least. Looking forward to coming over next month and we can have a chat about it and maybe i’ll bring my lucky bullet?